Note: This is the final installment of a three-part series exploring Tableau's own culture of self-service analytics. The first piece explored the benefits of data sources, and the second piece outlined the importance of an enablement platform. So you’ve started your journey toward a culture of self-service analytics. By now you’ve likely discovered how great data sources can be, and you're working to build an enablement platform. Next comes one of our most popular enablement programs, Tableau Doctor. You've probably heard of Tableau Doctor from our conferences—or perhaps you’ve even attended as a patient. Tableau Doctor is a time when Tableau customers can get one-on-one, in-person help with a Tableau expert. If you haven’t been before, be sure to check it out at Tableau Conference this year. We loved the idea so much that we started hosting weekly Tableau Doctor sessions here at Tableau. Employees can stop by to ask questions or get help building a data visualization. Tableau experts across the organization sign up for shifts as doctors. And others in the company can book time or drop by for open office hours. We’ve seen the power of Tableau Doctor across the entire organization. Employees in every department look to Tableau Doctor at various points in their data journey. New users want to understand complex data. Intermediate users want to dig deeper and think bigger. And advanced users want to stretch the limits of their data in smart and creative ways. We hold weekly Tableau Doctor sessions in offices across the world including Seattle, London, and Singapore. We also offer remote support to those in our smaller branches. Since we launched the program in January 2015, we’ve helped more than 300 people build visualizations in Tableau. Rick in Sales visited Tableau Doctor to dig deeper into his data—beyond the questions his team’s dashboards had anticipated. “Sometimes you have a clear picture for what you want answered, but don’t know how to get it. And it’s often impossible to communicate this to someone else and ask them to build it for you,” Rick says. Rick decided to solve the problem himself with a visit to Tableau Doctor. Working with a colleague he fondly calls his “primary care vizician,” Rick found his answers in just a half-hour. 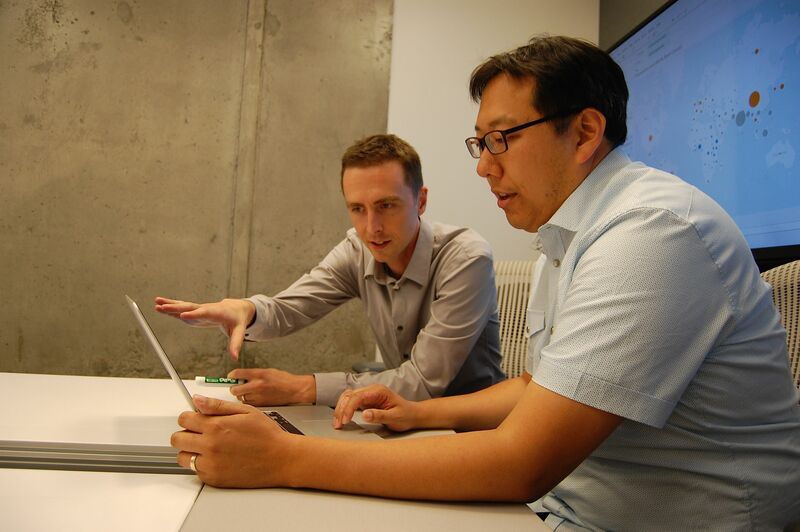 Before launching our Tableau Doctor program, we held several pilot sessions. For each session, we invited 20 Tableau users to join us with their questions. These sessions showed us what worked, what didn’t, and what we needed to add. Then we recruited doctors to launch the program at scale. We looked for people with Tableau knowledge and a big helping of the can-do spirit. Our first group included many who attended our early sessions. At the time, many future doctors were concerned they weren’t ready to take on the role. But they each embraced the challenge and proved to be an invaluable asset to their fellow Tableau users. Once we recruited our doctors, we set up a weekly time and location, then sent out an announcement. When you’re ready to implement Tableau Doctor at your organization, assess your deployment as the first step. Deploying Tableau Doctor for 10 people looks very different from doing so for 1,000+ users. If you have a small deployment, you can simply schedule a recurring meeting with all Tableau users. For larger deployments, we recommend using a scheduling tool, providing virtual options, and reaching out to other offices along with remote employees. Here are some additional tips to help you get started based on what we learned along the way. Pilot first: Start with a pilot. It will help you to find what works best for your organization. Offer one-on-one support: We found that one-on-one sessions are the most effective use of everyone’s time. Having multiple people all working on the same problem can cause confusion. During our pilot, we had one session with many people. It quickly became clear that pairing one doctor per user would be the most efficient approach. Book appointments: Allow people to book appointments. This can help make the best use of everyone’s time. We use an online scheduling tool, but really, anything from a wiki to a shared doc will work great! Offer remote support: Don’t forget about your remote employees. In our first few months, we forgot to send announcements to our remote employees. When we finally remembered to include them, our volume doubled from 15 participants to 30 each week! Make sure to include a virtual option (with a tool like WebEx or join.me) to include those who can’t join you in person. Include other offices: Don’t forget about other offices either. We’ve found it best to try to plant a small Tableau Doctor session in each office. So far we have locations in Seattle, London, and Austin. And we host virtual sessions for our colleagues in Dublin and Singapore. Use what you have: Make sure to leverage existing resources. Do you already have a scheduling tool? Do you have WebEx or something similar available? And don’t forget to promote on your enablement platform. Remember, you can always start small, maybe with one office, then scale out to others as you gain more experience. That’s the approach we took, and our program is now growing fast. The version 9.2 of the Tableau for Mac does not have the option to "Custom SQL" as the version for Windows? When I try to open an Excel spreadsheet with two folders in Mac the option is not displayed.